Dundee, 18th October 2017 - Outplay Entertainment, today, announces the global launch of BOOTY QUEST – the thrilling new match 3 adventure game. 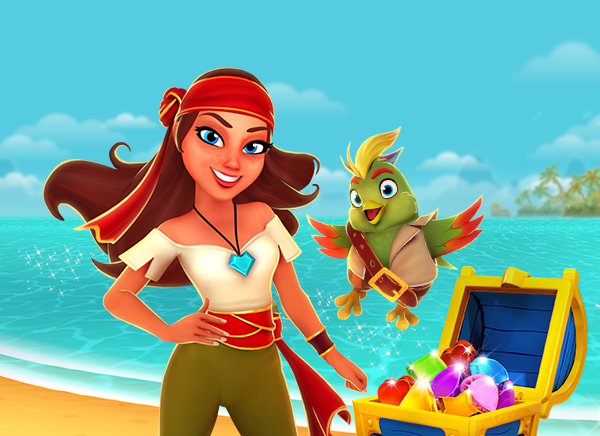 Players around the world can now set sail and join Piper, the bold pirate adventurer and her trusty crew of charming shipmates, as she sails the seven seas in search of legendary treasure. But watch out! It won’t all be plain sailing - the villainous Pirate Queen and her crocodile henchmen are hot on Piper’s heels trying to beat her to the loot! Players will go head-to-head with Piper’s foes in five gripping gameplay styles to progress through enchanting 3D worlds to collect treasure. If they’re bold enough, players can challenge their friends in daily ship races to earn extra booty, and help Piper in her quest to become the most celebrated pirate on the seven seas. Launching in 12 different languages, players from around the world can enjoy and become fully immersed in the adventure. So, what are you waiting for? Join the crew, grab the loot, fill your chest with booty, and rule the ocean! Booty Quest is available to download today for free.